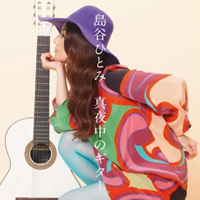 “Mayonaka no Guitar” is a cover of the 1969 hit debut song by Chiga Kahoru. It is a tender, warm song and Shimatani’s version will be a unique take on the classic. The choice to do another remake was probably influenced by her release of a cover album earlier this year. Although the new single isn’t an original song from the vocalist, it’s been a year and a half since her last release, so fans will definitely anticipate her upcoming work.